I’m going to start off by saying, that I know it’s a book about code, but this book is hilarious. Over the last year I have been attempting to turn my sons newfound love for video games into something more productive by having him learn some coding. 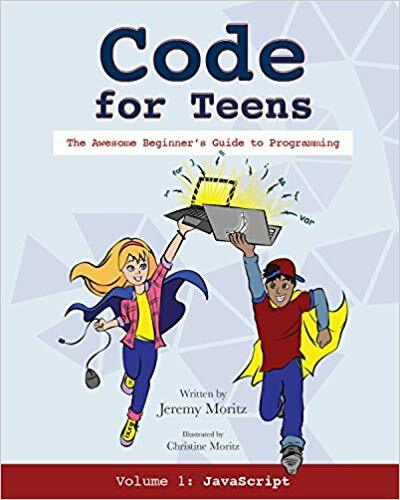 I was thrilled at a chance to grab The Awesome Beginner’s Guide to Programming (Volume1) From Code for Teens. Right away the book grabs your attention because with it’s cartoon characters and bright colors. The book itself “talks” in a very teen friendly language with witty comments and cheesy jokes placed throughout the lessons. It writes like a cool nerdy comic book. This book has over 200 pages full of lessons and activities that focuses on Java Script. 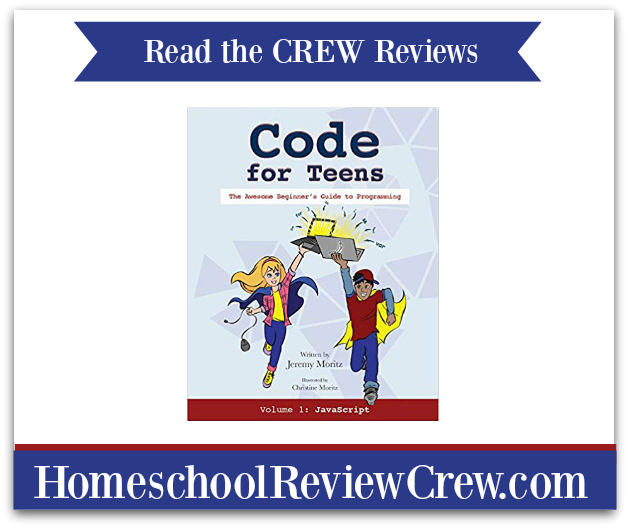 Each chapter is color coded in bright fun colors and illustrations, and ends with a quiz, a reminder of key concepts and drills to do. All answers are found at the end of the book along with a glossary of terms for quick reference. The only thing you really need to be successful with this book is access to a computer and the Chrome browser. There are 10 chapters to work through and each chapter is short at an average of about 10 pages. It took my son about 30 minutes to work his way through the chapters. I’m including the list of chapter names because the author obviously has a sense of humor. I love the cleverness. One of the things that quickly became abundantly clear is that my son is NOT a detail orientated person. Ha! Just kidding that was no secret, he is a boy entering his teenage years after all. This made this book a bit of a challenge for him, because although the text made it crystal clear that you should NOT forget the semicolon! But the lesson was learned and after his 8th time -or somewhere around that number, he read carefully enough to remember. Turns out, with coding you have to be pretty specific and following directions is pretty darn important. That lesson alone- earns this book an A+ from me. 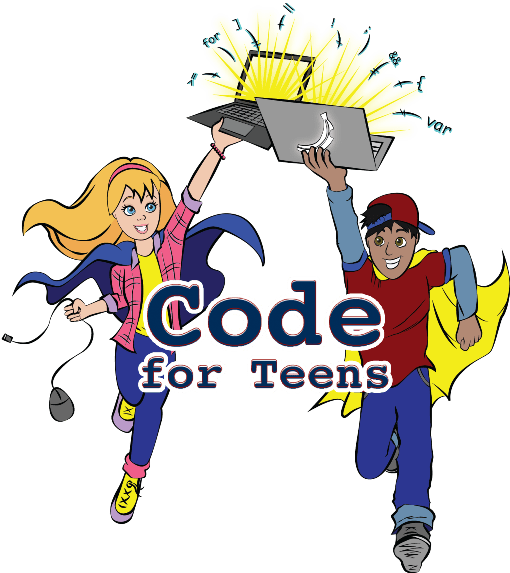 If you have a teen looking to learn code and you want something that is easy to follow along and have fun while you do it, this would be a great start into the world of code. In fact this book would make a great gift for a birthday or Christmas for that hard to buy for teen. Who knows, buy the book- then you may even be able to say that you were the one responsible for how the next CEO of Pixar got started. This review was fun to read! Thank you! I’m glad you like the book!